Carmen Rose Prose: Oops! Watch out for that... Snow! 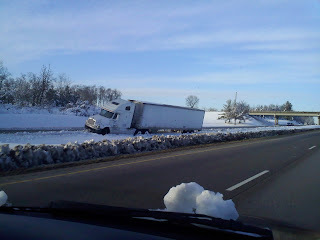 They've got most of the trucks pulled out by now, but here were a few of the "oops's that we saw on the way up the interstate due to the snow. On the last storm we saw a truck that just leaned right over on the bank, it looked perfect except for the fact that it was resting on only half it's tires. 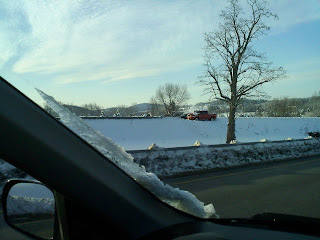 I heard that there were parts of the interstate shut down while military vehicles came in to pull the trucks up the hill so that the snow plows could clear the road, so that traffic could move again. One truck got part way up the hill and jack-knifed. Oops! The second whammy that we got this week didn't bring us much snow, but the wind has joined the party and now we are having significant drifting. 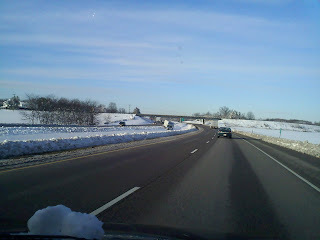 DH is just home from driving snow plow, was out at least 16 hours today. Well, this one isn't a stuck truck but kinda cool that I was able to catch a shot of that helichopper! Aren't the mountains pretty when they are dressed up with snow? !